Updating a heating system or fitting a new one can seem daunting – but it’s worth the effort to make your home a more comfortable place in which to live. Of course, lower fuel bills and improved energy efficiency are benefits you won’t want to miss out on, either. Whether your preference is for central heating, radiators, stoves, fireplaces or underfloor heating, our comprehensive guide covers everything you need to know about how to heat a home. Browse our heating hub for more information and advice. At its simplest level, a heating system has a part that generates the heat, and a part that distributes this output around a home. Both space heating and hot water are required in a property. So, the simplest of all heating systems would have: a boiler that uses fuel to heat up water and incorporates a pump to move it around; piping, to move the warm water around the house; emitters, whether radiators or underfloor heating; and, if the boiler isn’t a combination (combi) design heating water on demand, a cylinder to store hot water for use as required. The right heating system for your home should suit your property, lifestyle and budget. For many homes, a combination boiler will be suitable, providing heating to radiators and hot water as needed. For larger homes with higher hot water demand, a system boiler may be required, providing heating to radiators or underfloor heating, towel rails and hot water via a storage cylinder. A gas-fired heating system will cost around £3,000 to £5,500 for a typical 93m2 three-bedroom terraced house. If you live in an area without mains gas, fuel options for a heating system are oil, liquefied petroleum gas (LPG), electricity, solid fuel, or biomass. With the exception of electricity, all these options require fuel storage on site. The default option where no mains gas is available is usually oil-fired central heating. The capital cost for a 93m2 property is around £4,000 to £6,500, which includes a boiler, oil storage tank, hot-water cylinder, radiators, parts and labour. The installation cost for a bulk LPG heating system is slightly lower than for oil, as the tank is usually provided by the gas supplier on lease, but the running costs are slightly higher. An LPG tank can be buried, making it a good choice for those with limited space for an above-ground oil tank. LPG also offers options for a gas hob and real flame-effect gas fires. The most common and practical choice of biomass fuel is wood pellets, or wood chip. Systems are also available that burn logs and even straw bales. The cost of installing a biomass system is relatively high and you also need lots of space for the boiler, thermal stores and for the relatively bulky fuel. This means it’s usually an option only for properties with larger gardens and space for a plant room and fuel store, or an outbuilding to convert. As biomass heating is subsidised currently under the renewable heat incentive (RHI), it can be a cost-effective option when well designed. A relatively expensive fuel option for home heating, electricity is typically only used where there is no mains gas available and no space to store other fuel options, or nowhere to install a flue for a heating appliance. The most common electric option is storage heating powered by cheaper-rate off-peak electricity, such as Economy 7 and Economy 10. It’s worth exploring options for an alternative system that could reduce running costs. Electricity is commonly used as a retrofit underfloor heating solution in small rooms rather than a heating option for a whole home. Using the cooling technology of conventional refrigeration, heat pumps extract renewable solar energy from the air, the ground or a body of water. A heat pump is only a cost-effective option when carefully designed to ensure the average performance (the ratio of usable energy extracted per kWh of electricity consumed) offsets the high fuel cost. It is most economical if your home has a very low heat requirement because it has high levels of insulation and airtightness, and is combined with low-temperature heat emitters such as underfloor heating. When powered by green and or clean electricity, a heat pump is a sustainable heating option. While incentives to install solar panels have now disappeared, and the government’s feed-in-tariff scheme will have finished from 1 April 2019, on the up side, the cost of the panels themselves has come down and household batteries enable you to store the solar electricity rather than export it to the grid. Browse our essential guide to solar panels if you're thinking about this as an option. Tip: Solar panels need to be very carefully sited on a period home to avoid compromising the character. Planning permission is not usually required to fit them, although they must not face the highway if your home is within a conservation area. If your home is listed, you will need consent. Find out more about conservation areas and listed buildings in our essential guides. If your central heating and hot-water system is more than 10 years old, then the boiler, radiators and even the pipework may not be performing to their full potential and might be unsuitable for the needs of both your lifestyle and the building. Alterations or additions to the system over the years may not have helped and, if you are planning a major renovation or an extension, it is almost certainly time for a rethink. Most systems have a boiler or sometimes a stove at their heart, although eco heating options, including solar thermal panels and ground or air-source heat pumps (see above), are increasingly common, and can be integrated sensitively into a period home as well as newer houses. Wondering whether an eco heating system can save you money? Check out our handy feature for all of the answers. a combination (combi) boiler, which produces hot water to demand. Each system has its pros and cons. Combi boilers are usually the cheapest to install and run, and take up the least space, but they can’t supply more than one bathroom simultaneously unless they have an integrated hot-water cylinder or thermal store. For large households with more than one bathroom, a high-pressure mains-fed system is a good solution. Since 2005, condensing boilers, which use the waste heat in the flue gases to pre-heat cold water entering the boiler and are therefore much more efficient than older models, have been mandatory. Browse our essential guide to boilers for all the information you could ever need. Top Tip: Condensing boilers require a condensate pipe to drain away the condensed water. Sometimes this links to the waste under the kitchen sink, but it usually drains externally. This is an important aesthetic consideration for period home owners and should be thought through before the installation of the boiler. Likewise the position of boiler flues must be carefully planned, otherwise they can spoil the façade of a building. They are also prone to freezing, so need insulating. Correctly sizing a boiler is crucial. This is decided by means of a heat loss calculation, completed by a heating engineer. It will be affected by the house’s size and building materials, the level of insulation and airtightness, and your hot water requirements. Heating engineers have a tendency to slightly oversize boilers, rather than risk them underperforming, but try to ensure it’s not excessively powerful for your needs. Simplifying, upgrading and flushing through old pipework and adding corrosion and limescale inhibitors to radiators will make a heating system more efficient. Try to minimise the length of pipe runs to prevent unnecessary heat loss and water use. To retain heat, hot and cold pipes, as well as water tanks, must be thoroughly insulated, including joints and bends. Top Tip: Period home owners should note that joinery and floorboards will be disturbed when upgrading a heating system, so it’s worthwhile employing a skilled joiner to work alongside your heating engineer. Boards above fragile ceilings or those that may have to be taken up again in the future are best fixed with screws. Avoid notching the tops of joists to fit new pipes or cables, as this will weaken the floor structure. Good control is vital to the efficiency of a heating system and will ensure greater comfort. Thermostatic radiator valves are now common but further control can be gained by dividing a building into separate heating zones. This is particularly useful in larger houses where only a limited area might be used regularly, or spaces are used at different times of the day. Wireless technology is increasingly used for control systems and saves the need to run cables. Where cables or pipes do need to be run, carefully plan their route to minimise disturbance. Redundant chimney flues can be a good path from the top to the bottom of an old building. Do be aware of the risk of fire if blow torches are used to solder joints on pipework. Stop ‘hot works’ an hour before the end of the working day and ensure the area is checked before it is left unattended. During works, fit carbon monoxide and smoke alarms. Do ensure your boiler is serviced annually by a registered engineer to maintain its performance and safety. Do position thermostats so that they have a good air flow around them and are not subject to draughts or direct heat from radiators. Don’t allow anyone to work on your boiler unless they are properly qualified. Only engineers on the Gas Safe Register may work with gas. Don’t tamper with asbestos. It is a health hazard and often found around old pipes and heating installations. If you suspect it is present, seek specialist advice. Don’t forget to think of the future. If you are likely to want to install solar thermal panels or other renewable energy sources, check that the system you fit now will work with them. It is vital to get the size of radiators right – calculate the output you need in BTUs (British Thermal Units) using an online calculator like this from The Radiator Company. A heating engineer can also work this out for you. 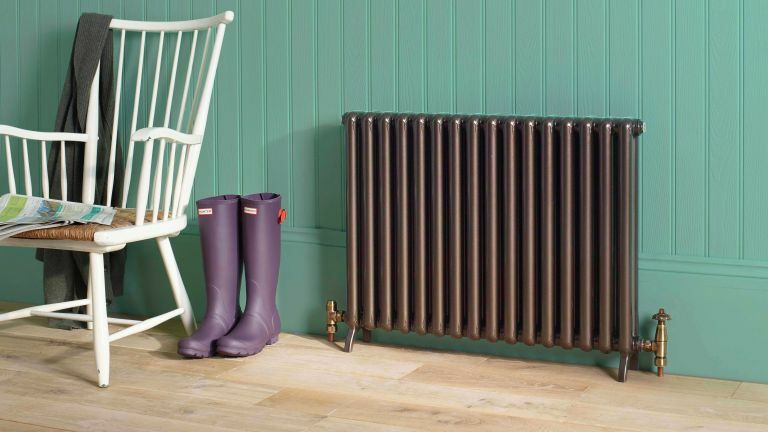 When it comes to style, choose from modern designs and traditional-look cast iron radiators. You can select school-style pillar cast-iron designs, or more ornate decorative models, which may be polished or painted. Original radiators that have been restored and updated to work alongside modern heating systems are also an option. Buying non-reconditioned models from a salvage yard or at auction might seem budget-conscious, but do find out refurbishment costs before investing. If your home has old cast-iron radiators, these can still be used but are best not disturbed during renovation work. Flush out debris with a garden hose. Areas of rust may indicate leaks, but it is always worth a pressure test to ensure there isn’t a problem. Bear in mind that the connections between modern pipework and old radiators may be of different sizes. Check out our essential guide to radiators for information on the best designs, models and fuel types. Both very comfortable and space-efficient, underfloor heating (UFH) is becoming an increasingly popular choice. The downside is that it does not provide instantaneous heat, so you need good controls with timers and a regular, predictable occupancy pattern to maximise comfort and energy efficiency. Find out about the types of underfloor heating available, costs and installation. Smart meters send automatic readings to your energy supplier, so there’s no need for estimated bills and usage, which should help control your spending on gas and electricity. Most smart meters use wireless or mobile phone-type signals and are available in handheld form, so you can see how much power is being used in kWh and m³, and in pounds and pence. Every household in England, Scotland and Wales will be offered a smart meter free of charge by 2020, fitted by your energy supplier. Your supplier will contact you to tell you when you can get one, or you can contact it and request one. They aren’t compulsory, but you may not have access to all the available tariffs if you don’t have one. Note that the data collected by a smart meter belongs to you, not to the energy supplier, meaning they are not allowed to share your information with third parties or for use in marketing campaigns without your prior consent. The government has recently published guidelines to protect homeowners’ privacy, which includes offering you the ability to choose how often your supplier accesses your readings, such as half-hourly usage. However, when data is required for regulation purposes and when bills are being produced, the company can gain access to view the figures. Concealed heating systems that are an alternative to underfloor heating include skirting board and wall panel heating. You could also look at warm air and mechanical ventilation systems, or infrared heating panels. Warm-air heaters are quick and easy to fit, and are highly controllable. They can be retro-fitted or installed in new builds. Visit Johnson & Starley for more details. New homes that are built to be efficiently insulated and airtight can avoid the need for central heating with a mechanical ventilation system with heat recovery (MVHR) that distributes heat, which could be given off by a wood-burning stove, or even general appliances. Infrared heating warms people and objects directly. The air becomes warm as a secondary effect and stays warm for longer because it is surrounded by a warmed thermal mass. The electric panels are easy to install and can be used with solar panels. The ultimate cosy centrepiece for a room, a wood-burning or multi-fuel stove is also a highly efficient way of heating a space. While the majority of heat from an open fire disappears up the chimney, stoves are sealed and designed to burn fuel as efficiently as possible. Ranging from freestanding appliances positioned in the corner of a room to those designed to sit within traditional fire surrounds, stoves are a flexible choice, too. They are mainly available in cast iron or steel, but are available in a range of designs and can be enamelled with a coloured finish. If you have an old model, cleaning and maintaining your stove properly will help improve performance. Fuel options for stoves include wood, coal, oil, gas, LPG, electricity and pellets. If you choose a multi-fuel stove, it can be used with wood or coal, and you will need a grate when burning coal/smokeless fuel. This grate is removed when using logs, as they burn better on a hot bed of ash. Generally, solid-fuel stoves tend to produce large amounts of heat, but are less controllable than gas, oil and pellet models. If you live in a smoke control area, you’ll need a Defra-approved stove. Note that from 2022, all new wood-burning and multi-fuel stoves – no matter where you live – need to meet Ecodesign legislation. This will require stoves to be at least 75 per cent efficient. Look out for the SIA Ecodesign Ready label when buying. Find out more in our essential guide to choosing a stove, then browse our pick of the best stoves to find the best model for your home. Where a room has a large fireplace or hearth, don’t be tempted to opt for a bigger stove that will be visually in proportion. Running a stove with too high a heat output for the space it occupies will make the room uncomfortably hot. While traditional open fires are not as efficient as stoves, they are an authentic option for many period homes, and if you have an original surround or grate in place, you should look to restore rather than replace and check that the structure of the chimney is still sound. Find a local chimney sweep at HETAS. If you are specifying a new fire and concerned about efficiency, consider a modern gas-fuelled fire that is highly controllable and offers a realistic effect. If you don’t have a chimney, you could opt for a flueless gas or electric fire, or one that burns bioethanol, which doesn’t emit harmful gases. Find out how to maintain the fireplace and chimney in your home. If your home is historic, get an authentic look. In Georgian homes, fireplaces were often open – inglenooks were introduced – with a fire basket or hob grate. Surrounds were of brick or stone. In later years, and in grander houses, marble, slate or wood were used. In the Victorian era, hob grates were popular, but from 1850 the cast-iron register grate appeared. Corbels were often used to support the mantel and, from 1880, the smoke hood was introduced. Tiled cheeks were popular between 1880 and 1900. In Edwardian times cast-iron register grates were common, before Art Nouveau designs came into fashion. Simple, classical models were also popular, often using marble or enamelled slate. Glazed bricks were also often used, as were ornate oak surrounds with mirrors and shelves. Find more fireplace design ideas in our gallery. Bear in mind that all fires, solid or gas, require a hearth that meets the building regulations.